What's the Difference Between a Game Designer & Developer? There are many different jobs and roles to fill during the production of real-world video games. Perhaps the most popular job titles you hear thrown around are game developer and game designer. While the two jobs may sound similar, in reality they are uniquely different roles filled by different types of thinkers. This means there’s a good chance you’ll be drawn to one speciality over the other. Let’s dig in and found out what designers and developers do. In the video game industry a game designer is a creative person who dreams up the overall design of a video game. In essence this means that designers are the people that create the initial framework for what will become the final product. Because this work is usually completed far ahead of everything else in the production cycle, good work here is essential to building the best possible game. Depending on the employer, designers may be further divided into even smaller groups, which work on only one particular aspect of the game. This is because a significant number of smaller groups can complete highly specific tasks much faster than one large group working on only one thing at a time. The exact aspects that make up a complete game design project can vary greatly depending on the genre. For example, if you’re working on a football video game such as Madden your game layout and objectives will be nothing related to those used by first-person shooter games such as Halo or Call of Duty. This phrase is often the cause of much confusion because not only is the term ‘game developer’ used to describe an actual job position, but also a phrase used to describe a gaming company. For example, terms such as ‘video game studio’, ‘video game publisher’, and ‘video game developer’ can all be used to accurately describe a company that makes video games. Nevertheless, in the context of this article, a video game developer is a person or more often a group of people that convert the ideas and objectives of the design team into the actual game. In other words their main job is to turn a vision into a reality. The thing is, no matter how awe-inspiring the game is that the designer envisions it doesn’t just go from a bunch of concepts, drawings, and rules to being a playable video game on its own. The developers’ entire job is to convert the sketches, layouts and storylines into a playable product. They accomplish this by writing tens or even hundreds of thousands of lines worth of computer code, which accurately represents what the designer had in mind. Luckily, most development teams don’t have to create all of this code from scratch. In many cases the video games we play today are designed and implemented on top of prebuilt computer software, which is often referred to as the ‘engine’. 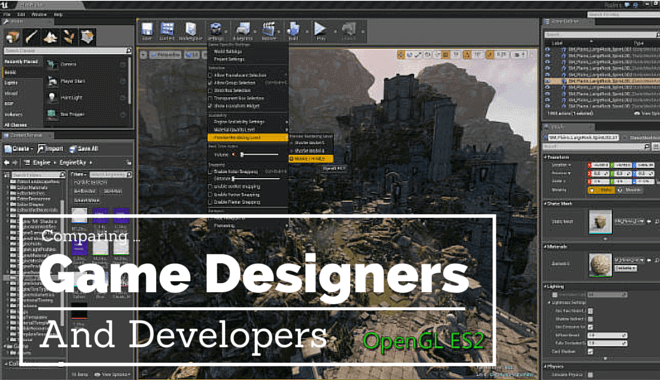 Major studios such as EA, Microsoft, and Activision usually use their own proprietary gaming engines whereas independent developers rely on open source options such as CryEngine, Unity or Unreal Engine 4.